I didn’t want to make a lunch because it was Monday morning and I was tired, so I made Wyatt eat school lunch. He was none too happy about it though. Augie keeps asking to go to the beach and I have to tell him over and over that it’s too cold. Yes, we live in California, but it is Northern California and it’s February! There’s no way I want to sit on a cold, windy beach right now. 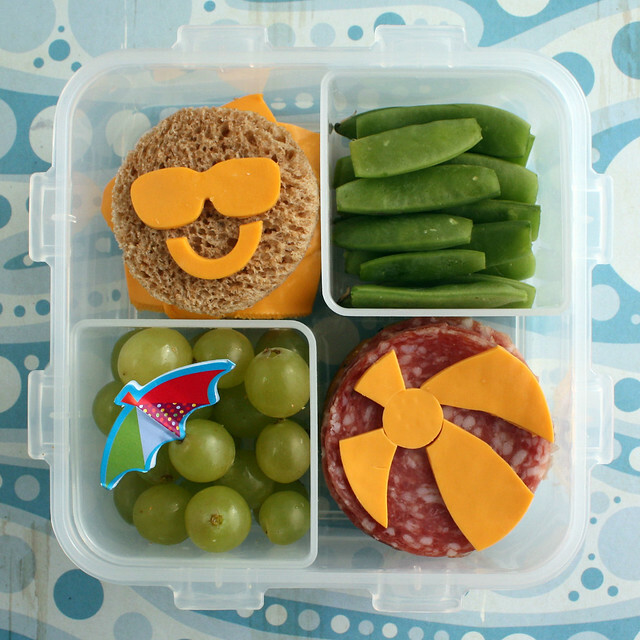 In an attempt to appease him, I made this sunny beach lunch in our Lock & Lock 4-up box: a sunshine sandwich with sunglasses and a smiley face, sugar snap peas, grapes with a beach umbrella pick, a salami beach ball and a stack of crackers (not visible in this picture but they’re under the salami). The soy cheese I used for the sun sandwich got a little droopy so it’s hard to see the “rays” sticking out, but you can see a better photo and get an idea of how I put it together in this post I wrote for Hellobee. The sunglasses and smile were made with this set of cutters. 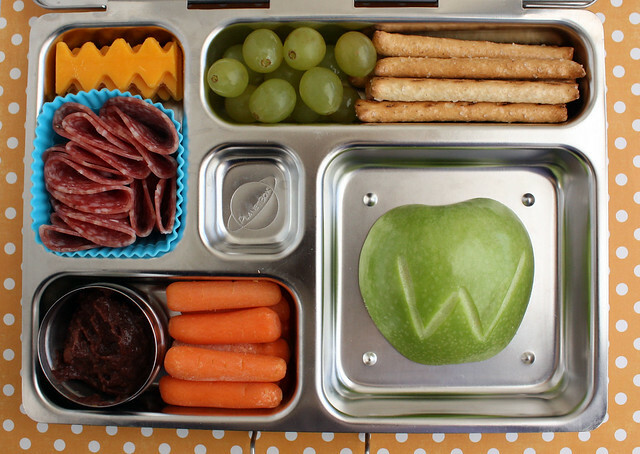 Wyatt’s lunch box held zig-zaggy cheese strips (I used this new cutter set to make them), salami, grapes, whole wheat pretzels, a big chunk of apple with his initial carved into it, carrots and black bean dip. This was packed in the PlanetBox . 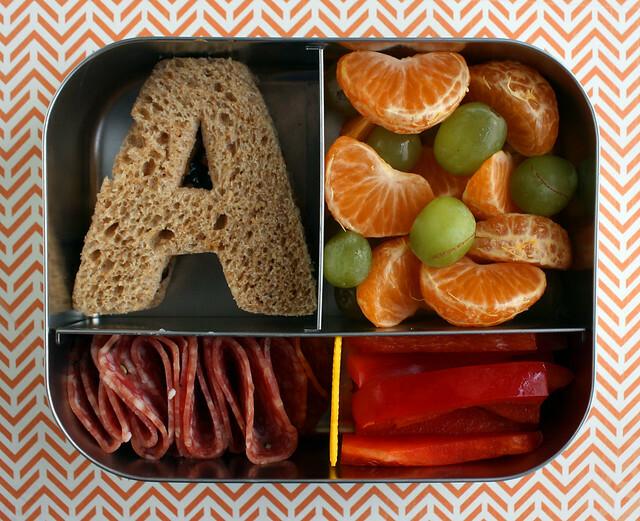 On Wednesday Augie had an “A” sandwich filled with peanut butter and jelly, grapes, mandarin oranges, red pepper strips and salami. I used the Lunchbots Trio for packing. 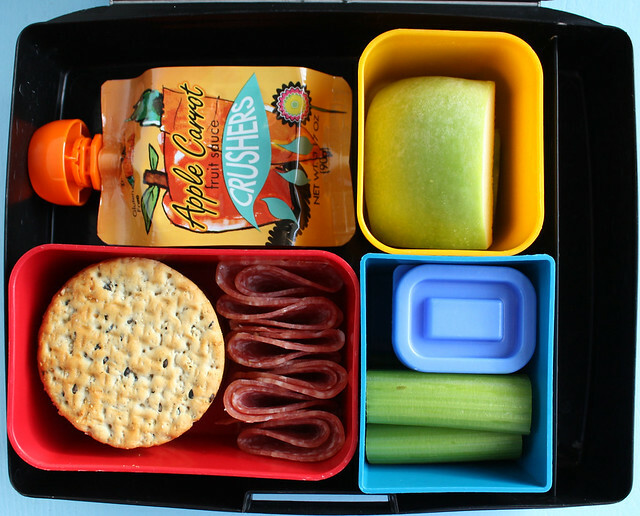 Wyatt had a simple Laptop Lunches bento: an apple-carrot crusher, apple chunks, celery sticks, bacon-cheddar-ranch dip, salami and 9 grain crackers. The celery and dip are something new we are trying to get Wyatt to eat more veggies (he’s on an informal vegetable strike at the moment). He’s been enjoying celery with peanut butter at home, but we can’t send that in his lunch because his school is nut free. Both the celery and the dip were untouched when he came home though. 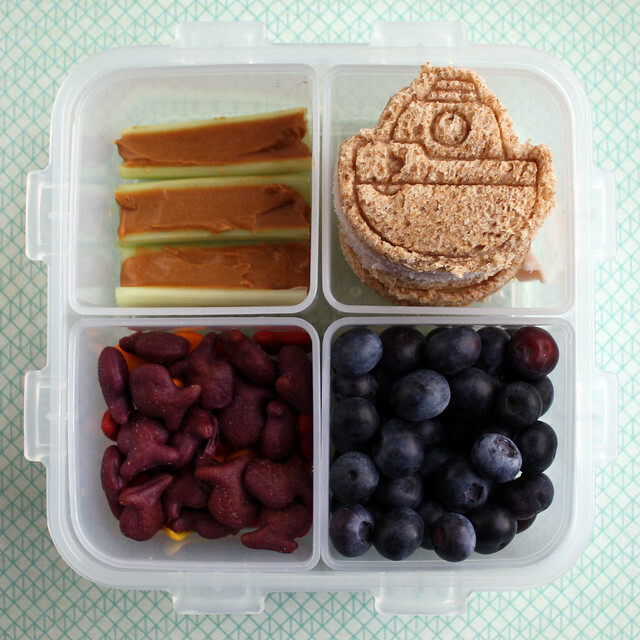 This lunch for Augie had a smidgeon of an ocean theme: celery with peanut butter, turkey sandwiches cut and stamped with a boat cutter, blueberry “water” and goldfish crackers. I picked all the purple ones out and put them on top to make them look like water, but I don’t really think it worked that well. 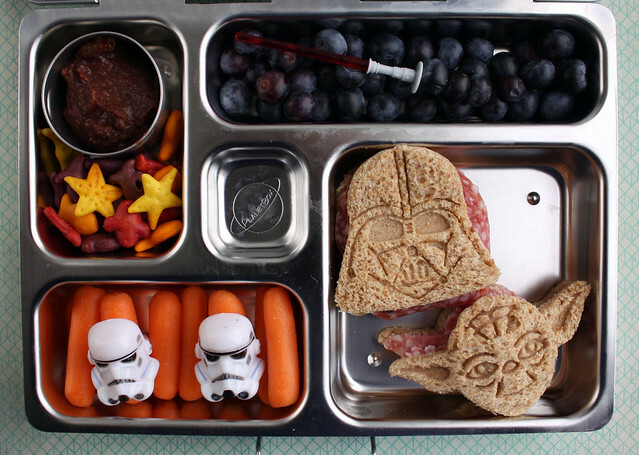 Wyatt had a Star Wars bento — always a favorite! I packed black bean dip, space goldfish crackers, blueberries with a light saber pick, Darth Vadar and Yoda salami sandwiches (cutters are available from Williams-Sonoma), and carrots that were guarded by stormtroopers. Find the light sabers and stormtroopers here. 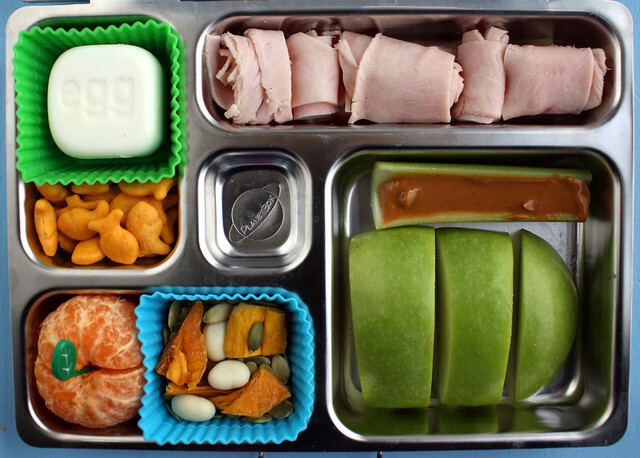 Today Augie had a snacky lunch: a square, helpfully labeled egg, goldfish, turkey roll-ups, a lone piece of celery with peanut butter, apple chunks, “mango lassi” snack mix from our Graze box, and a mandarin orange. Wyatt also had a simple lunch: potato chips (!! 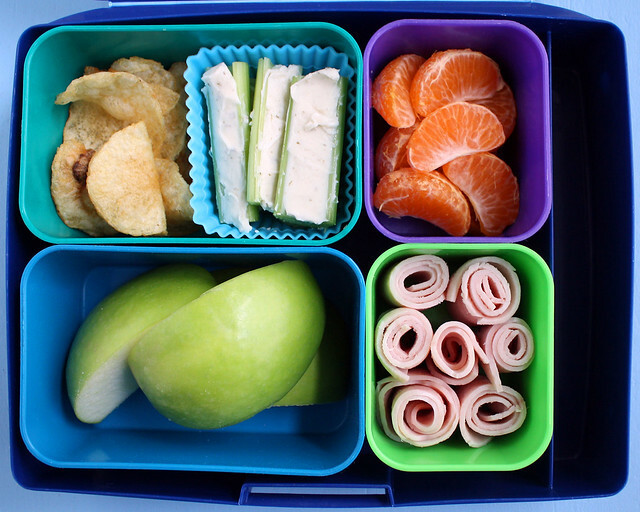 ), celery with Laughing Cow cheese (another attempt to tempt with veggies), mandarin orange wedges, turkey roll-ups and apples pieces.